And now for something completely different…bread made from scratch! Gluten free! This is definitely going out on a limb in here, for I rarely keep any kind of breads in my house, and while I love to cook I can’t remember making bread from scratch ever. Maybe a pie crust or cake awhile back, but not a loaf of bread! And certainly not gluten-free. Oh boy…gluten free eating. There is so much information out there about gluten intolerance, Celiac disease and on and on. So many stories about the benefits of cutting gluten out of our diets. I am no expert in diet or nutrition. 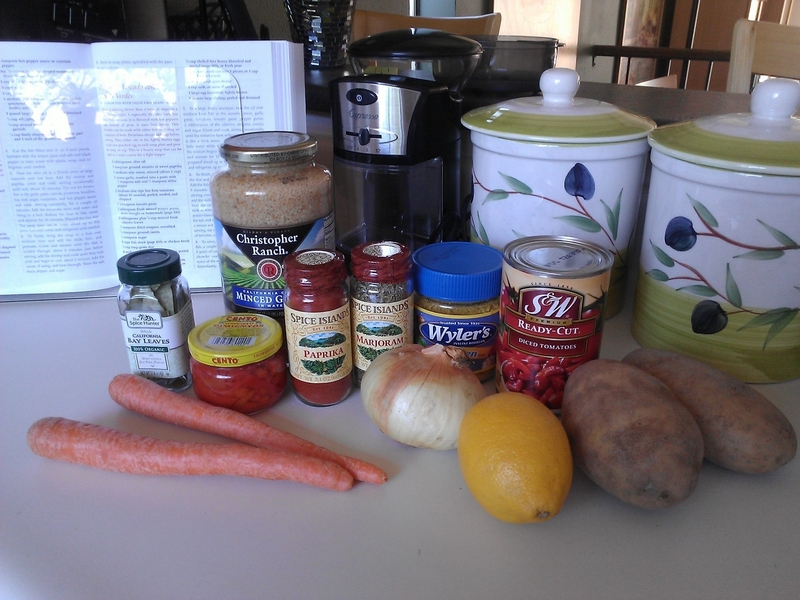 But I love to cook and thought…why not try a GF recipe? Maybe try eating GF for a while and see what happens? I haven’t been diagnosed intolerant, but I haven’t specifically been tested for it either. One thing to note about GF eating…it can be expensive. I don’t know the exact reason for this, but one seems to be that the best selections of GF foods are in specialty grocery stores where prices are going to be higher in general. Now this isn’t always the case 100% of the time – remember this is amateur hour GF blogging in here today. I’m learning…and enjoying the journey! Personally I don’t have a problem with spending a little more on food. Eating out, cooking and even grocery shopping itself are all huge pleasures for me. Adventurous and fascinating! I like to say that what we put in our bodies – our fuel – is so essential, so why not make it the best? And if that means spending a little more, why not? Now if I was married and raising 5 kids I might think differently about grocery shopping. I recently picked up a copy of Artisanal Gluten Free Cooking, by Kelli and Peter Bronski. And I really hit the jackpot with this book. It’s beautifully written and easy to understand. It’s very warm and welcoming – not snooty or pretentious. As you might expect, the first part of the book talks about gluten – what it is and what intolerance means. It also provides tips on how to navigate the grocery store and how to read ingredient labels. Gluten is not always going to be called out as “gluten” on a label. It can be hidden in things like soy sauce or yogurt. The authors even go on to recommend NOT buying GF things like potato starch or brown rice flour in the bulk food section of the store to save money. There is risk of cross-contamination with the containers and scoops. Yikes. So this weekend I went in a completely different cooking direction and baked a loaf of bread. I was intrigued by the GF flour recipe that is the foundation of so many of the recipes in this book – breads, cookies, waffles, cakes and pasta. The authors recommend making a large batch of it (meaning, quadruple their recipe) and storing it in an air-tight container in the fridge. I made the batch as-is (about 3 cups) and used all of it in the bread recipe. But first, a trip to the grocery store was in order. I’m familiar with a few specialty ingredients, and knew the best place to start was the PCC in my neighborhood. The staff is super friendly and knowledgeable. If they don’t have something you need, they will go to the ends of the earth to find it for you! 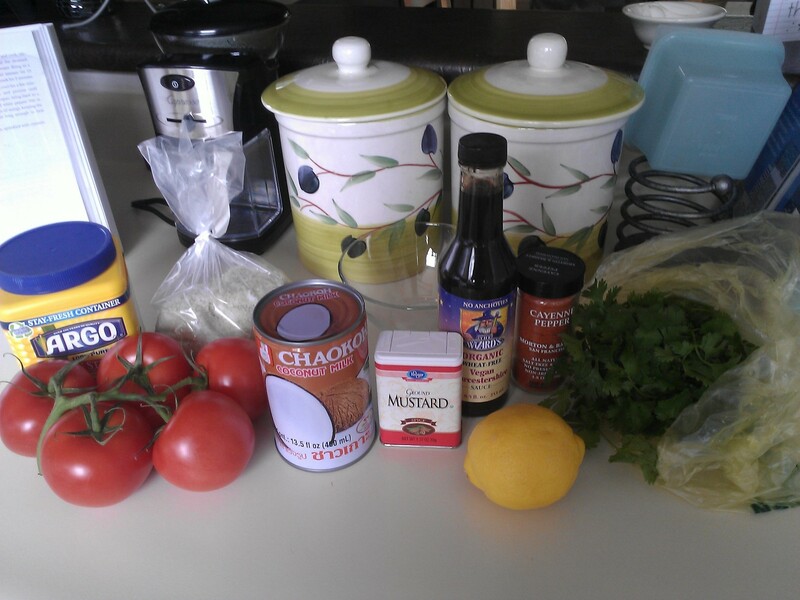 So in this picture we have about $30 worth of ingredients. See what I mean about pricey? Much more $$ than your everyday garden variety plain ol’ white flour. The topper was the 8 ounces of xanthan gum – $12! What the hell is xanthan gum, you might be wondering? Well, it basically is the substitute for gluten. It binds ingredients together like gluten does. So don’t leave it out trying to save a few bucks! You won’t be very happy how your recipes turn out. The one thing that stumped me was potato flour. 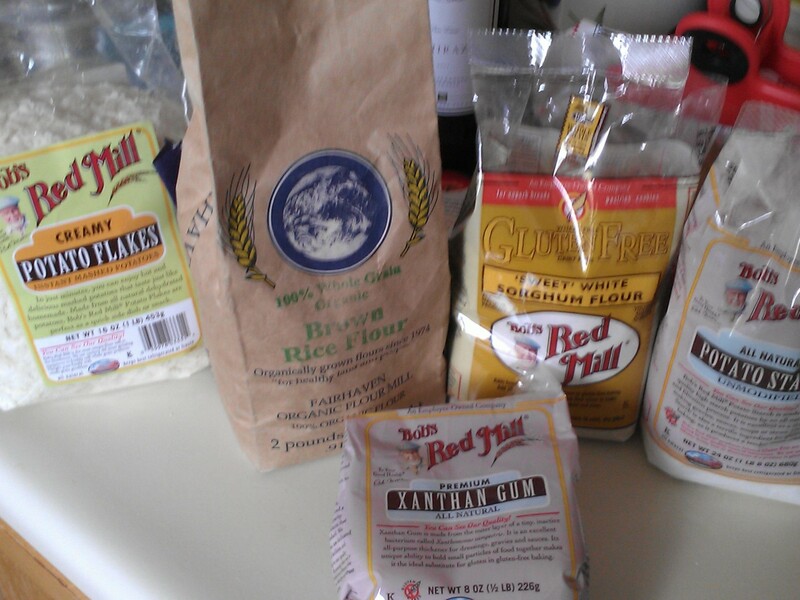 I had no problems finding the potato starch, but couldn’t find potato flour anywhere. So I asked one of the guys for help and he returned with another guy in tow. They explained that potato starch and potato flour are exactly the same thing. Hmmm…I wondered…is this true? 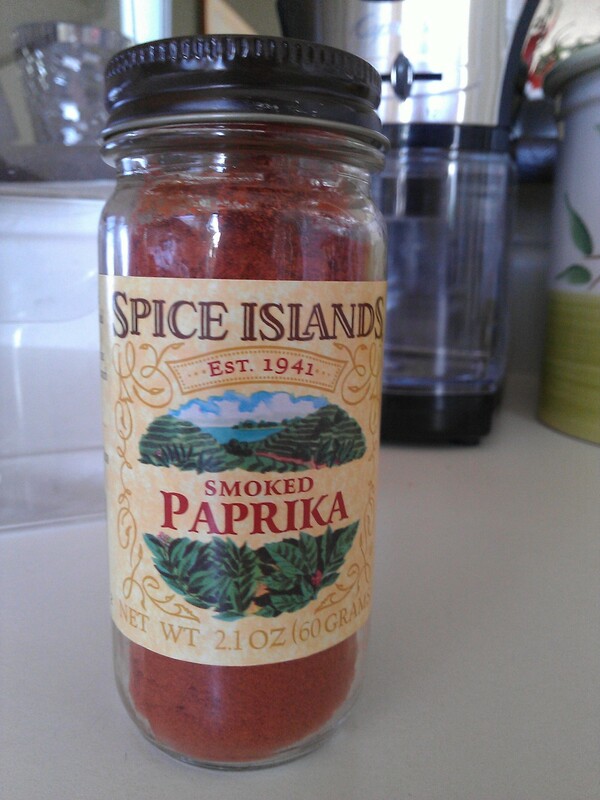 I told them that the recipe I’m going to do calls them out distinctly as two separate ingredients. So they recommended using dried potato flakes and pureeing them in a food processor into a flour. Sounds good to me! I don’t know if this is what the authors intended, so I still want to research this further and see if other stores carry potato flour. Or I might just have to poke around online. I used the bowl attachment of my Cuisinart Smart Stick Blender and it worked beautifully for this basic recipe – about 3 cups total. Grease a 9 x 5″ loaf pan. Heat the milk, sugar, salt and butter in a small saucepan over medium heat until warmed and the butter is fully melted. If the milk heats too quickly before the butter fully melts, remove the saucepan from the heat and finish melting the butter. Mix the GF flour, xanthan gum and yeast in a large bowl. Add the warm milk mixture, stirring to combine. The dough will be very sticky. 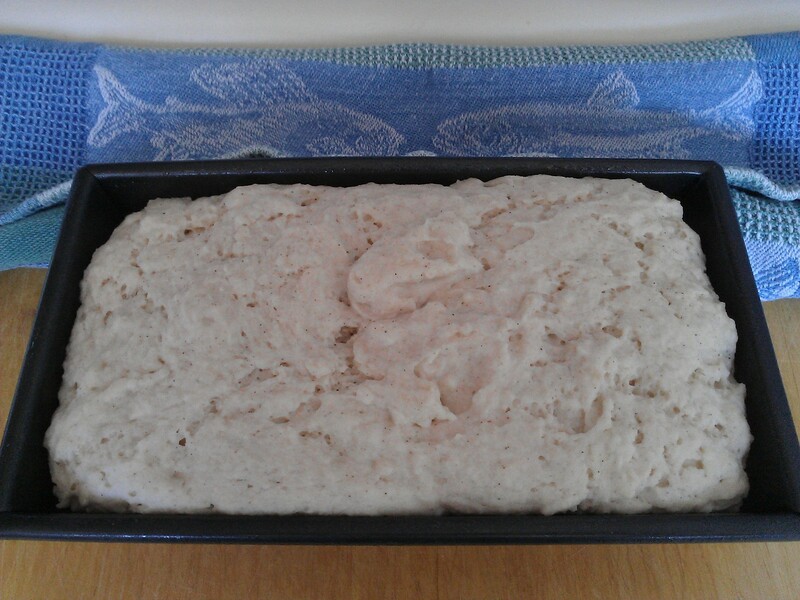 Spread the dough in the prepared loaf pan. Cover and let rise in a warm location free from drafts for 30-60 minutes or until doubled in size. Preheat the oven to 375 degrees F. Bake the loaf for 40 minutes, or until firm to the touch. Here’s what my loaf looked like just before popping it in the oven – yum! I had covered it loosely with a kitchen towel. My cooking time was a little longer than 40 minutes. Test by inserting a toothpick in the loaf. If it comes out clean, the bread is done. And the verdict? Wonderful! The bread turned out very moist, not crumbly. I tried a slice plain, and while it’s OK on its own I would recommend using it for sandwiches or for dipping in soups. Great news – it’s a blank canvas! I’m very excited to try more recipes in this book…buon appetito!